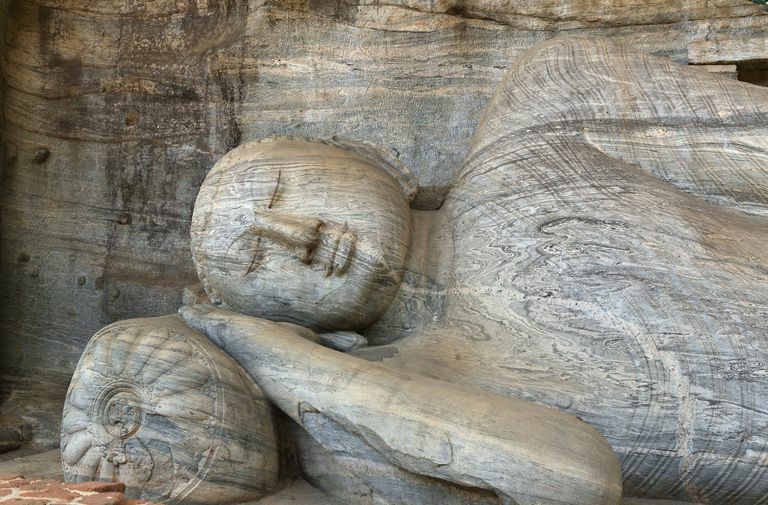 Parinirvana Day — or Nirvana Day — is observed primarily by Mahayana Buddhists, most commonly on February 15th. The day commemorates the death of the historical Buddha and his entry into final or complete Nirvana. Nirvana Day is a time for contemplation of the Buddha’s teachings. Some monasteries and temples hold meditation retreats. Others open their doors to laypeople, who bring gifts of money and household goods to support monks and nuns. Note that in Theravada Buddhism, the Buddha's parinirvana, birth, and enlightenment are all observed together in an observance called Vesak. The time of Vesak is determined by lunar calendar; it usually falls in May. The word Nirvana means "to extinguish," such as extinguishing the flame of a candle. It's important to understand that the people of ancient India considered fire to be a bit of atmosphere that had become trapped by fuel. This bit of atmosphere burns angrily and fitfully until it is released to become cool, peaceful air again. Some schools of Buddhism explain Nirvana as a state of bliss or peace, and this state may be experienced in life, or it may be entered into at death. The Buddha taught that Nirvana was beyond human imagination, and so speculation about what Nirvana is like is foolish. In many schools of Buddhism, it's believed realization of enlightenment causes living people to enter a kind of partial Nirvana, or "Nirvana With Remainders." The word parinirvana refers to a complete or final Nirvana realized at death. The Buddha died at the age of 80 -- possibly of food poisoning -- in the company of his monks. As recorded in the Parinibbana Sutta of the Pali Sutta-Pitaka, the Buddha knew his life was at an end, and he assured his monks that he had withheld no spiritual teaching from them. He urged them to maintain the teachings so that they would continue to help people through the ages to come. Finally, he said, “All conditioned things are subject to decay. Strive for your liberation with diligence.” Those were his last words. As might be expected, Nirvana Day observances tend to be solemn. This is a day for meditation or reading the Parinibanna Sutta. In particular, it is a time to reflect on death and impermanence. Nirvana Day also is a traditional day for pilgrimage. The Buddha is believed to have died near a city named Kushinagar, located in the modern-day state of Uttar Pradesh in India. Kushinagar is a major pilgrimage destination on Nirvana Day. The Nirvana Stupa and temple. The stupa marks the place where the Buddha's ashes were thought to have been buried. This structure also contains a popular reclining Buddha statue, depicting the dying Buddha. The Wat Thai Temple. This is considered one of the most beautiful temples in Kushinagar. It is formally called the Wat Thai Kushinara Chalermaraj Temple, and it was built with donations from Thai Buddhists and opened to the public in 2001. The Ramabhar Stupa marks the place where the Buddha was thought to have been cremated. This stupa is also called the Mukutbandhan-Chaitya.